Sharleen Ollivier came to Woodhouse from Hendon School and lives in Golders Green. She studied Spanish, English literature and sociology at A level and graduated in 2018 with AAB. She is currently at the University of East Anglia studying Modern Languages. 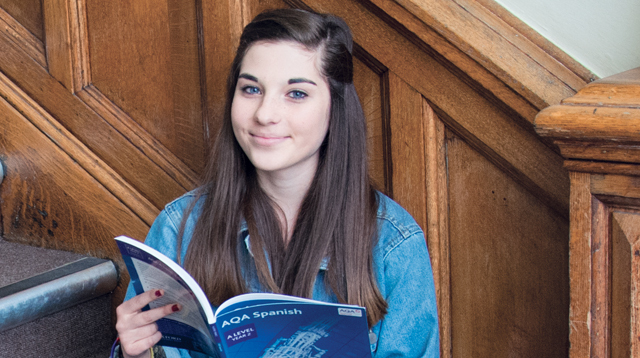 “I’ve wanted to study Spanish at A level since I went on an exchange trip to Madrid when I was in Year 10. The trip was a week-long exchange and then my partner came to London, and we are still in touch now. It was then that I decidedI wanted to become fluent in Spanish and I know that by the end of the A level I’ll be at a high standard. I could have stayed at my school sixth-form but the grades and study areas were kind of limited. And I didn’t want to go somewhere that taught BTEC and lots of other stuff – I thought it was better to go somewhere that focused on just A levels. Also, in GCSE we only studied the language but here we learn about the history and culture of Spain and South America, which really interests me… Which is strange because I purposefully didn’t pick history A level because I thought I was bad at it, but I was surprised at how interested I am in Spain’s history –the civil war and Franco’s dictatorship… And I like that we look at different perspectives in Spanish and in English sociology. In a recent lesson, we discussed immigration pros and cons and that ties in with my other subjects. When we have exams coming up, you can pretty much sign up every day to do extra speaking lessons with either of the teachers, or the Spanish assistant, and that is really helpful. Last term I went to them so much I imagine they were getting annoyed by me but it was so useful because they told me more or less what grade ­­­they would have given me for that work and I could build on it. Also, the subject tutorials are great. They encourage you to go by making two of them compulsory per half term, so you have to sign up, but you can sign up to all of them if you want and you can do loads of practice exams. Modern languages students from SOAS, University of London visited us with their teacher to talk to any students that were thinking of studying modern languages at uni next year which and was helpful, because I am. I’m definitely applying to University of East Anglia and maybe elsewhere too - I like it there because they have a very flexible course and you can study new languages too. They teach a Modern Languages degree where you study advanced Spanish and then other modules, like beginners or intermediate French. For an extracurricular activity I went on the ‘Spain in London’ trip and we went to an area near Portobello Road where there were loads of tapas restaurants and Spanish shops and stuff. I was like… ‘I’m coming back here’, I was really surprised it existed. I also took debating as an extra activity which is useful for my personal statement. I’m interested in talking about controversial topics and seeing different sides of view and we discussed topics that might be a bit taboo in some schools such as Feminism or whether single gender schools are good or bad – things like that. It was fun. I really like the students here, it’s not cliquey or anything like that and I feel comfortable in lessons, especially in Spanish. There’s a lot of group work and the students are nice and even if you are not friends already it’s not a problem, because we get along well and we do the work together. There’s such a better vibe here – a more mature vibe. You’re treated like your age and have the freedom to make the choices that you want to – that prepares you for uni. I’m actually surprised that people do use their free periods (for study). The library is always packed!